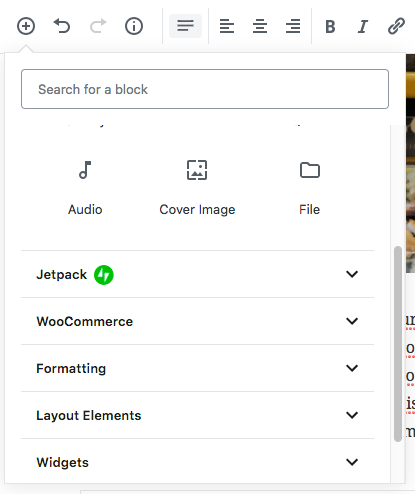 When I'm searching for a block, my eye is instantly drawn away from the names of all the block categories, and to the green Jetpack logo, because it stands out far more than anything else. This pulls my eye away from the information that I need in order to complete my task, and towards information that is not useful. At best, it makes things look a little nicer without any functional benefit to users. At worst, it creates a race-to-the-bottom where every plugin competes for the user's attention by adding their own brightly-colored logos. At that point, the Inserter will look cluttered, garish, and visually inconsistent. I think the ideal solution is to remove support for these icons, because they hurt UX and serve no functional purpose. As a compromise, forcing the icons to be black-and-white would remove the worst parts while preserving the ability to have icons. We had a discussion about this in today's ticket triage on the design channel. I do agree that adding coloured icons distract and can end up in a competition of brands. This can lead to cognitive overload for users. Therefore I endorse removing support for these icons. The design team discussed this today with strong opinions... we are concerned the colorful icons at this category level add cognitive load. -For some of us with dyslexia - the incorporation of icons at this level only helps (some of us) if EVERY entry has them. The alternative to use black and white only seems a bit better but still not worth the cognitive load. I agree I think the ideal solution is to remove support for these icons, because they hurt UX and serve no functional purpose. I also noticed these branded icons come in on other places in the editor, like the sidebar. Maybe this needs a different ticket, or else we could go about the use of coloured, branded icons in general. Since there won't always be icons for every panel, it also creates a mismatch in the overall weight of these headings, making it harder to parse them as equal elements. The potential value here in making the distinction between panels more clear isn't sufficient to warrant the additional noise and cognitive load created by adding the icons. I'd be on board with removing them entirely.